"Xw" redirects here. For other uses, see XW. "X-wing" redirects here. For other uses, see X-wing (disambiguation). Rebel T-65B X-wings (the Red Squadron) in Star Wars (1997 Special Edition). BTL Y-wings (the Gold Squadron) are visible at the center right. The X-wing starfighter is a fictional spacecraft from the original and sequel Star Wars trilogies and the Star Wars expanded universe. Designed and manufactured by the Incom Corporation, they are depicted as the primary space superiority interceptor, close air support and dogfighter of the Rebel Alliance, the New Republic and the Resistance. They are armed with four laser cannons and two proton torpedo launchers, which allowed for extended multi-role missions that required versatile balance of speed with firepower. The craft has been merchandised as a variety of toys, models licensed for use in games, novels and comics. Industrial Light & Magic's (ILM) Colin Cantwell sketched and built models that eventually became the final X-wing fighter in Star Wars. The X-wings were designed to appear more "traditional" than the Empire's TIE fighters. ILM built miniatures in various scales, with wing markings indicating which prop represented which pilot. When ILM fell behind on generating X-wing footage, Star Wars producer George Lucas and his editors temporarily used World War II dogfight footage for initial editing cuts. Each X-wing model was built around a hollow core made from surgical tubing, which allowed lighting, cooling, and electrical connectors for the wing motors to be installed and maintained. The cockpit windows were made from faceted glass so that accurate reflections could be filmed. Although the movie's initial script and novelization describe the X-wings as belonging to "Blue squadron", limitations in bluescreen photography led to the markings on the filming models, as well as the fictional squadron affiliation being changed to red. In addition to miniatures, the production crew made a single, full-size X-wing for scenes in the Rebels' Yavin IV base hangar; combined with cardboard cutouts and careful editing, the Rebels appear to have dozens of fighters. The production crew also made a full-size X-wing cockpit that was used for all actors; the astromech droid visible behind each actor was changed for each starfighter. Background noise pitch and tone also varied between X-wings to further differentiate the characters piloting them. The "lake" in which Luke Skywalker (Mark Hamill) crashes his X-wing in The Empire Strikes Back was only 3.5 feet (1.1 m) deep, requiring the creation of a rig resembling the starfighter sitting in the lake at an angle. The rig was built in hinged sections so it could be manipulated by frogmen to sink or rise, a key feature for the scene when Luke fails to levitate his ship from the water. In 1993, ILM visual effects specialist John Knoll created a proof of concept test of dogfighting X-wings and TIE fighters to demonstrate the feasibility of using commercially available desktop computer software for simple animation work. This resulted in numerous parts of space battle scenes being "re-shot" as digital animations for the original trilogy's Special Edition releases. The ARC-170 starfighter seen in Star Wars: Episode III – Revenge of the Sith is the ancestor of the X-wing and is deliberately reminiscent of the X-wing's design. 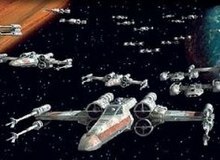 X-wings with their s-foils locked in attack position as they assault the Death Star in Star Wars (1997 Special Edition). The expanded universe states that Incom Corporation designers defected to the Rebel Alliance and handed over the X-wing's design. One design of the Z-95 Headhunter is based on an initial Johnston X-wing sketch; the Z-95 has since been described as an X-wing precursor. The Star Wars: The Roleplaying Game supplement book The Star Wars Sourcebook identifies the original trilogy models as being T-65s, while Star Wars: The Force Awakens Incredible Cross-Sections identifies those seen in Star Wars: The Force Awakens as T-70s. According to roleplaying and other material, X-wings depicted in the movies and expanded universe material that takes place around the same era are equipped with four laser cannons and a pair of proton torpedo launchers. The fighter has two flight modes: one in which the wings are flat and another when they are expanded into "attack position", affording the wingtip lasers a larger fire area. "S-foil" servomotors control the transition between the two, hence the expression "to lock s-foils in attack position". Lacking an on-board navigation computer, they rely on an astromech droid to calculate hyperspace jumps. The Rebel Alliance adopted the military strategy of Doctrine of Space Denial, wherein the Rebellion would raid Imperial boneyards and shipping frigates, both to disrupt Imperial logistics and operations, and also to requisition desperately needed materials. X-wing hyperdrive capabilities allowed for this kind of harassment and escape before the Empire may react. The presence of a hyperdrive and deflector shields differentiate the X-wing from the Empire's TIE fighters, emphasizing the importance the Rebels place on pilots surviving their missions. Novels and roleplaying material state that the X-wing continues to be refined and upgraded in the years beyond Return of the Jedi; the "XJ"-series X-wings depicted in the war against the Yuuzhan Vong have a third proton torpedo launcher, stronger lasers, and improved engines. Kenner Toys produced an X-wing toy as a complement to its action figure line in 1978; this model was made from formed plastic and had a battery-operated light and buzzer in the forward fuselage. The "s-foils" were activated by depressing the molded astromech droid. In 1982, a "battle-damaged" version was released using the same mold but with damage stickers, a grey fuselage, blackened engine inlets, and a darker canopy. In countries outside the U.S., the electronics were removed and the R2-D2 “button” was chrome (apart from the U.S., the electronic X-wing was only available in Brazil, Canada, and France). Kenner also produced a die-cast 1:72 miniature X-wing in 1978 and a smaller scaled version with "battle damage crash feature" for the short lived Micro Collection line in 1982. The X-wing appeared in four Micro Machines three-packs, including the first Star Wars pack released, a bronzed version, and a pack of three "battle damaged" X-wings with different colored markings. The Micro Machines X-wing has also been released in two single-packs, as a promotional souvenir with German video releases, in a nine-pack of Original Trilogy vehicles, and once in clear plastic. The X-wing appears eight times in the Micro Machines Action Fleet toy line: Luke's starfighter on its own, with "targeter" stand, with Dagobah swamp damage, and in a double pack with a TIE Fighter, Wedge's starfighter on its own, and as a component of the Yavin Rebel Base playset, a toy based on the prototype packaged with Biggs Darklighter's starfighter, and Jek Porkins' starfighter. Lego also released several X-wing models, including a 76-piece miniature X-wing/TIE advanced kit, a 263-piece X-wing (1999/2002), a 563-piece X-wing kit with Yoda's Hut (2004), a 437-piece X-Wing (2006), and a 560-piece X-wing (2012). A 1,304-piece "Ultimate Collector's" model was released in 2000. A new "Ultimate Collector's" model with 1,559 pieces was released in 2013. X-wings also appear in numerous Star Wars games and Expanded Universe stories. The player pilots an X-wing in the Atari Star Wars game. It is also a playable ship in numerous LucasArts games, and is the eponymous vessel in the first of several space combat simulator games. Both the Rebel Assault and Rebel Assault II rail shooters include X-wing levels, and X-wing squadrons are controllable units in the Rebellion and Empire at War strategy games. Decipher and Wizards of the Coast published X-wing and X-wing-related cards for the Star Wars Customizable Card Game and Star Wars Trading Card Game, respectively. Michael A. Stackpole and Aaron Allston wrote the X-wing novel series that focuses on the X-wing pilots of Rogue Squadron and Wraith Squadron, the former expanding the story of pilots like Wedge Antilles who appear in the films. Dark Horse Comics has also published an X-Wing Rogue Squadron series. In 2012, Fantasy Flight Games released the Star Wars: X-Wing Miniatures Game featuring several pilots and variations of the ship. The X-wing also included in its Star Wars: Armada miniatures game and Star Wars: Rebellion board game. A model of Luke Skywalker's X-wing was among 250 Star Wars-related items on display at the National Air and Space Museum celebrating the franchise's twentieth anniversary. An original X-wing filming prop sold at auction for $160,000 in July 2016. In 2007, the San Diego Tripoli Rocket Association built and launched a 23-foot (7.0 m) X-wing model propelled by four rockets, which exploded seconds after launch. A life-size X-wing is suspended from the ceiling at the Star Trader gift shop in Disneyland in California, as well as one displayed outdoors by the Star Tours attraction at Disneyland Paris. A life-size X-wing made from Lego blocks appeared in Times Square, and a ¾-size replica is on display at the Wings Over the Rockies Air & Space Museum in Denver. ^ "Y-wing Fighter". Star Wars Encyclopedia. Lucasfilm. Retrieved 2012-03-19. ^ a b c d "X-wing starfighter (Behind the Scenes)". Star Wars Database. Lucasfilm. Archived from the original on 2011-06-29. Retrieved 2007-10-16. ^ a b c Peterson, Lorne (2006-11-14). Sculpting A Galaxy: Inside the Star Wars Model Shop. Insight Editions. ISBN 1-933784-03-2. ^ "Red Leader (Behind the Scenes)". Star Wars Database. Lucasfilm. Retrieved 2007-10-16. ^ a b "The Evolution of Space Battles". Homing Beacon. Lucasfilm. 2005-09-15. Archived from the original on 2007-11-12. Retrieved 2007-10-16. ^ "ARC-170 starfighter (Behind the Scenes)". Star Wars Databank. Lucasfilm. Retrieved 2007-10-14. ^ a b c d e Star Wars Roleplaying Game (Second Edition, Expanded & Revised ed.). West End Games. 1996. ISBN 0-87431-435-6. ^ "Z-95 Headhunter (Behind the Scenes)". Star Wars Databank. Lucasfilm. Retrieved 2007-10-16. ^ Walker, J.D. ; Steve Miller (2002-02-01). The New Jedi Order Sourcebook. Wizards of the Coast. ISBN 0-7869-2777-1. ^ "The Vintage Vault: Looking Back at Kenner's X-wing Fighter - StarWars.com". starwars.com. 9 June 2015. Retrieved 22 December 2016. ^ "#1: X-wing, Millennium Falcon, Star Destroyer (1993)". Star Wars Cargo Bay. Lucasfilm. Archived from the original on 2007-06-21. Retrieved 2007-09-01. ^ "#III: Darth Vader's TIE Fighter, Y-wing, X-wing (1995)". Star Wars Cargo Bay. Lucasfilm. Archived from the original on 2007-06-21. Retrieved 2007-09-01. ^ "#XIII: Battle-damaged X-wings (red, blue, and green) (1997)". Star Wars Cargo Bay. Lucasfilm. Archived from the original on 2007-08-20. Retrieved 2007-09-01. ^ "Bronze 3-pack: AT-AT, Snowspeeder, X-wing". Star Wars Cargo Bay. Lucasfilm. Archived from the original on 2007-09-30. Retrieved 2007-09-01. ^ "Single carded vehicle: X-wing Starfighter (1995)". Star Wars Cargo Bay. Lucasfilm. Archived from the original on 2007-11-12. Retrieved 2007-09-01. ^ "Single carded vehicle: X-wing Starfighter (bronze)". Star Wars Cargo Bay. Lucasfilm. Archived from the original on 2007-11-12. Retrieved 2007-09-01. ^ "Trilogy Gift Set". Star Wars Cargo Bay. Lucasfilm. Archived from the original on 2007-11-12. Retrieved 2007-09-01. ^ "X-Ray Fleet #II: X-wing, AT-AT". Star Wars Cargo Bay. Lucasfilm. Archived from the original on 2007-11-12. Retrieved 2007-09-01. ^ "Luke's X-wing Starfighter". Star Wars Cargo Bay. Lucasfilm. Archived from the original on 2007-11-12. Retrieved 2007-09-01. ^ "Flight Controllers - X-wing Fighter". Star Wars Cargo Bay. Lucasfilm. Archived from the original on 2007-08-08. Retrieved 2007-09-01. ^ "Luke's X-wing from Dagobah Swamp". Star Wars Cargo Bay. Lucasfilm. Archived from the original on 2007-11-12. Retrieved 2007-09-01. ^ "Classic Duels: X-wing Fighter vs. TIE Fighter". Star Wars Cargo Bay. Lucasfilm. Archived from the original on 2007-11-12. Retrieved 2007-09-01. ^ "X-wing (2 stripes)". Star Wars Cargo Bay. Lucasfilm. Archived from the original on 2007-09-27. Retrieved 2007-09-01. ^ "Yavin Rebel Base playset (Action Fleet Set)". Star Wars Cargo Bay. Lucasfilm. Archived from the original on 2007-09-30. Retrieved 2007-09-01. ^ "Series Alpha: X-wing Starfighter". Star Wars Cargo Bay. Lucasfilm. Archived from the original on 2007-11-12. Retrieved 2007-09-01. ^ "X-wing (6 stripes)". Star Wars Cargo Bay. Lucasfilm. Archived from the original on 2007-11-12. Retrieved 2007-09-01. ^ "Mini X-wing Fighter and TIE Advanced". Star Wars Cargo Bay. Lucasfilm. Archived from the original on 2007-11-12. Retrieved 2007-10-16. ^ "X-Wing Fighter". Star Wars Cargo Bay. Lucasfilm. Archived from the original on 2007-11-12. Retrieved 2007-10-16. ^ "Ultimate Collector's Set X-Wing Fighter". Star Wars Cargo Bay. Lucasfilm. Archived from the original on 2007-11-11. Retrieved 2007-10-16. ^ "Star Wars Customizable Card Game Complete Card List" (PDF). Decipher, Inc. 2001-08-23. Archived from the original (PDF) on September 28, 2007. Retrieved 2007-08-23. ^ "Star Wars: Omnibus--X-Wing Rogue Squadron Vol. 1 TPB". Dark Horse Comics. Retrieved 2007-10-16. ^ "X-Wing (TM) is Now Available". fantasyflightgames.com. Retrieved 22 December 2016. ^ "STAR WARS (TM): Armada". fantasyflightgames.com. Retrieved 22 December 2016. ^ "STAR WARS™: Rebellion". fantasyflightgames.com. Retrieved 22 December 2016. ^ Brown, Jennifer (2 January 1997). "Smithsonian 'Star Wars' exhibit honors series' gifts to the imagination". Seattle Post-Intelligencer. Retrieved 16 October 2007. ^ Reilly, Claire (July 4, 2016). "X-pensive X-Wing: Star Wars prop fetches $160,000 at auction". CNET. CBS Interactive. Retrieved July 11, 2016. ^ Irwin, Mary Jane (27 November 2007). "Star Wars-Obsessed Rocket Geeks Build and Launch an X-Wing Fighter". Wired News. Condé Nast. Retrieved 10 December 2007. ^ Larson, Eric (23 May 2013). "LEGO Unveils Giant X-Wing Fighter in Times Square". mashable.com. Ziff Davis, LLC. Retrieved 15 April 2019. ^ "T-65 X-Wing at Wings Over the Rockies Air and Space Museum". Wings Museum. Wings Over the Rockies Air and Space Museum. Archived from the original on 5 March 2014. Retrieved 15 April 2019.